The Motiv Lethal Paranoia is a deadly combination of a ultra clean coverstock with an amazingly fast backend response. This bowling ball is ideal for medium oil by pairing the Hexion coverstock technology with the oblivion core. The cover on this ball produces length and great angle. The core in this ball achieves an angular backend motion through its dual density design and higher RG which retains energy to create a hard flipping ball reaction. Description: The Lethal Paranoia has the Hexion Cover Stock used on the Trident Quest, except this ball has a hybrid version of it. This is the third Paranoia in the series and continues to use the Dual Density Oblivion Core. 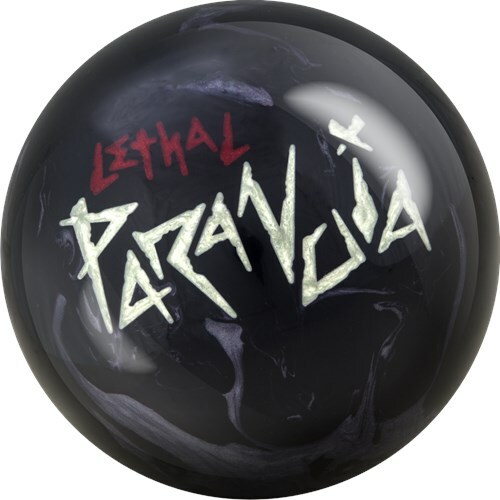 The Lethal Paranoia will be found in the Medium Oil/Angular category of MOTIV’s Ball Guide: (http://www.motivbowling.com/resources/ball-guide.html). Please use this guide to help determine what ball will best suit you or to compare your current MOTIV balls! Reaction: This ball is the quickest I’ve ever loved a ball directly out of the box. I tend to need some time to determine where the ball will fit in and the strengths and weaknesses of the ball. The Hexion cover stock once again provides easy length, unlike anything else MOTIV has ever developed. With as straight as it is through the front part of the lane it more than makes up for down lane. I don’t want to just tell you this ball goes “long and strong”. I feel like as clean as it is though I can’t throw it through my breakpoint, it always catches the spot down lane and it catches it very hard. My carry percentage has never been so good with a ball that produces this type of shape. Comparisons: I’d like to start by comparing the Trident Quest. The Trident Quest is the better choice if you start on fresh with higher volume, only because the asymmetrical core gets the ball to start sooner and just isn’t as quick as the Lethal Paranoia, allowing you to control the lane early on. I am not saying the Lethal Paranoia won’t be used on fresh, because I think the Lethal Paranoia will be a perfect choice for league play. The Octane Carbon is quite a bit rounder down lane and is definitely not as strong overall. Once the lanes open up the Lethal Paranoia is going to be my choice on a lot of patterns. Summary: The Lethal Paranoia has become a benchmark ball for when I need steeper angles. It will also provide you with the most pronounced amount of hook you have seen to date. I have done some surface modifications on the Hexion Cover Stocks and it does get them rolling sooner, but I really feels it defeats the purpose of this cover stock! The Lethal Paranoia is the second ball using the awesome new Hexion coverstock technology, originally introduced with the Trident Quest. The Hexion Hybrid reactive coverstock provides a clean cover that produces an insane backend reaction towards the pins. Paired with the Oblivion weight block, it compliments the angular backend motion to flip hard at the end of any oil pattern. If you thought the Trident Quest could make a turn on the backend, then the Lethal will absolutely blow your mind. I have not been able to provide this much backend motion with any other recent MOTIV release and it fits perfectly in my bag right under both my Trident Quests. I am able to play almost any area of the lane on various patterns from house to sport and know that this ball will recover and shatter the pins. My Octane Carbon creates a similar motion on the backend but the Lethal is stronger and provides a better read from the front of the lane whereas the Octane responds only on the backend. Adding some MOTIV Power Gel Polish, I was able to create some more shape on the backend and play larger angles without the ball sliding through my breakpoint. The Hexion cover on the Lethal gives me that added edge for more difficult conditions and perfects the Paranoia line. This ball is a must have for any level of bowler from league to tournament play, do yourself a favor and go pick one up today from your Local Pro Shop! Layout 1 (Pin Down): 50 x 4 x 80, x-hole 3 inches down from PAP on VAL. Pin Down: This drilling is the same pattern that I used on my chronic paranoia. Compared to that, it is about 2 and 2 to the right. This ball is much more cleaner thru the front part of the lane than the chronic mainly due to the new hexion coverstock technology and box finish preparation. It picks up slightly later in the midlane but is much stronger on the backend. Pin Up: This drilling pattern really shows off what the ball is intended to be. This drilling was very clean and effortless to get thru the heads, stores lots of energy, and is very responsive to friction, further outside and off the end of the pattern. This ball was about 4 and 2 left of the chronic. That makes this ball about 6 and 4 stronger than the pin down counterpart I drilled. If you are looking for easy length, later roll, and really fast response to friction this is a great piece of equipment to put in your hands. Much like the Chronic, this will be a benchmark type ball. So far this ball has taken well to different surface preparations to fine tune reaction. The Lethal Paranoia creates incredible length matched with a Lethal backend reaction. This is the 3rd time Motiv has used the Oblivion core which has quickly become known for its hitting power and ability to throw pins around. The Hexion hybrid coverstock has an extremely fast response to friction which creates a lot of recovery on shots that I missed to the outside on house shots. When the front part of the lanes begins to dry up or on medium length pattern this is the ball I go to. I can get the ball to clear the front part of the lane without sacrificing hitting power. Motiv’s second ball sporting Hexion technology is out and all I can say so far is that angularity is back with a vengeance. The Lethal Paranoia combines the new Hexion Hybrid coverstock (5500LSP finish) with the higher RG, dual density Oblivion core (2.53RG, .047Diff) to create a medium oil ball that responds to friction in an impressive manner. Leaving mine at box finish I decided to put my longer, quicker responding layout on it to compliment the skid-snap reaction this was said to have; that is exactly what I got. The Lethal has no issues getting through the fronts with the clean cover/core duo it has. Once friction is found, however, watch out! The response time from projection to hooking back is impressively short, creating quite the sharp angle towards the pocket. I have yet to find a spot where getting too far left is an issue as the motion this ball creates can be beneficial for swinging it as much as fading it from deeper angles. Typically I can start a league night with my similarly-drilled Trident Quest (sanded to 2000) and seamlessly transition to the Lethal once the former starts to labor due to its big block. Several times I have actually had to make an immediate 2-1 to 3-2 left when ‘balling down’ to this Paranoia as that friction response time loves to take advantage of the burn created to the right. This Hexion duo has been quite the one-two punch for me so far. If you want a true skid-snap piece meant to tackle transition and medium oil conditions, once the Quest starts to hook a bit too much, this is hands down the ball you should put in your bag. The New Lethal Paranoia is a monster all in itself. The latest release from Motiv in a the Paranoia line is a welcomed addition to say the least. This release is the strongest ball for down lane motion in the Paranoia line. Since the inception of the Paranoia line, the line has quickly grown to be my go to line for equipment. So, with the new Lethal the question is how do I drill this monster? I have drilled 2 of the Lethal's. The first was 60 X 4.5 X 60, second was 45 X 4.25 x 60. The first Lethal is cleaner to the spot with more down lane motion. This ball was good when there is a spot to toss the ball to and let it clear the front part of the lane. The second Lethal is not as clean through the lane "which I like". This ball is rounder in shape, though its a relative round shape compared to other offerings Motiv has. The slower transition of the second Lethal makes this ball a little more predictable and a little less dry sensitive. What I like about the Lethal is it is cleaner through out the lane as whole. The OG Paranoia sees the lane a bit easier and has less defined shape. It is my thinking the Lethal is going to be a ball that will allow me to start a lot of blocks with and chase the pattern left, especially on medium volume and length patterns. The shorter patterns are going to be tough for this ball as there is to much friction and will be difficult to control the motion. I am excited for this new addition to the Paranoia line and very much look forward to using this ball into the tournament season. If you enjoyed the OG Paranoia and are looking for a cleaner more responsive motion the Lethal is going to be answer. Summary: I’ve never wanted the Paranoia to roll up front because that was not its intended purpose, not to say that it couldn’t roll up front but it did not excel at doing so. The strength of the Paranoia was down lane angularity, so never fathomed the idea of a Paranoia being a cleaner throughout the lane and provide me with cornering angularity. Enter the Lethal Paranoia. As clean and as straight throughout the lane as this ball is I had a hard time throwing it through the breakpoint as once is got down lane and encountered friction it was a hard encounter indeed, what I really consider a plus about the Lethal is when I back out of the ball I still get the best of what it has to offer without going through the breakpoint. I found the Lethal to excel on the fresh but not on heavier volumes of fresh as I found the cover to be too clean for what I was trying to accomplish, in cases of heavier fresh I deferred to my Trident Quest as the asymmetrical core gets the ball to start sooner than that of the Oblivion core. The Carbon Octane has a rounder shape than that of the Lethal however overall it isn’t as strong as the Lethal, in terms of opening up my angles I would go with the Lethal over the Carbon. I tend to use the Carbon when I’m controlling the backends instead of using them to my advantage. I’ve never thrown a Motiv ball that has not done as advertised and the streak continues with the Lethal Paranoia, if you’ve wanted more upfront and still need it to corner the Lethal Paranoia doesn’t disappoint. I encourage you to inject your arsenal with Lethal Paranoia. Your game will thank you for it. MotivNation will take a nation to stop. Bowling is about what the bowler believes it to be, so what is bowling to you friend? This ball is the newest introduction into the Paranoia line of bowling balls. The MOTIV Lethal Paranoia features the incredible new Hexion Hybrid Reactive coverstock combined with the Oblivion core. It's very clean through the front of the lane and has a ridiculously fast backend response. Most importantly, it features the continuation through the pins that MOTIV balls are becoming known for. It will be a great fit in your bag on medium to light oil. The Lethal Paranoia will become that ball you can count on when you need to go away from the pocket and have no fear that it will recovery giving you the angularity and continuation you need to go through the pins. My Lethal Paranoia is laid out is pin up (above the ring finger), the cg shifted right and no extra hole. This ball has already found a place in my bag and drives through the pins with easy from an insane angle. If you are looking for a ball with crazy backend reaction, continuation and awesome hitting power. Look no further, you've found it. The Hexion Hybrid cover and in combination with the Oblivion core allows this ball to push through the heads and creates multiple angles of attack. This ball out of the box creates deeper angles and with the Oblivion Core you know it will come back with a vengeance. My favorite part about this ball is how it revs up quickly yet doesn't GRAB the lane causing it to burn up energy early. The backend motion is being preserved by the higher RG and when it exits the pattern the hitting power is "Lethal". Speed and revs allow me to use this ball with a longer pin to play the track even if it's blown up. Playing inside and on top of the pattern sometimes makes me nervous however the Lethal Paranoia give me confidence!! Don't think twice about it. This ball is a must and should have a home in everyone's MOTIV arsenal. To sum it up: "This ball has the shape of a hockey stick"
I can see people enjoying the Lethal Paranoia on the right conditions. I think it is a better match up of core to cover than the Trident Quest. I can also buy the ball being placed in the “medium condition” spectrum. With the last few releases, I struggled to understand Motiv’s placement in their lineup chart. For example, we found the United Revolt and Primal Fear more angular than the Trident Quest. I also think the original Paranoia might be a bit more angular than the Lethal but they are pretty close. If you previously liked the Paranoia, you will like the Lethal. Motiv has smooth and controllable motion off the breakpoint, meaning medium reacting to dry boards. I think Motiv should tout what they’re good at rather than try to chase something else. If you look at it that way, the Lethal is a good ball. Join Lane Side Reviews as they take the MOTIV Bowling #LETHALParanoia To the lanes in our latest episode. The Lethal Paranoia is hands down the most versatile ball in my bag. The new Hexion Hybrid cover really allows this ball to get through the fronts and have a super fast response to friction. What I really enjoy about the Lethal Paranoia is that just how versatile this ball is. I can use this ball throughout an enitre block if I need to or is my go to ball once my rising starts to burn up. I found that if I scuff it with a 2000 pad I can play up the boards on the fresh and as the surface wears down on the ball and lanes break down I can chase in with it without the ball using up its energy in the fronts. This ball compliments my Jackal Rising perfectly for when I need to start to chase the shot in because my Rising is too aggressive. Where do I start? Did I say this ball might be the one I throw the most?! It is incredible how versatile this ball is! The weight block Oblivion has to be the most versatile in the market. I have 2 Lethal Paranoias and there is a great reason. My pin down allows me to bowl on medium to long patterns either in fresh or burned. While the pin-up lethal gives me a great response on medium to short patterns either in fresh or burned. As a two-handed bowler, it is hard to find those loyal balls that you know you can trust will strike as soon as you let them go off your hand. If I leave a flush 9 pin, there is almost always a messenger coming back to take it down. Oh and 10 pin messengers too my friend. This one and the Villain are ALWAYS in my bag! Page created in 0.718 seconds with 22 queries.